Premium Protein Blend (Whey Peptides, Whey Protein Isolate, Whey Protein Isolate 97%), Natural And Artificial Flavor, Salt, Soy or Sunflower Lecithin, Cookie Crumbs (Rice Flour, Sugar, Cocoa [Processed with Alkali], Tapioca Starch, Palm Oil, Corn Starch, Natural Flavors, Salt, Sodium Bicarbonate, Soy Lecithin), Gum Blend (Cellulose Gum, Xanthan Gum, Carrageenan), Sucralose, Acesulfame-Potassium. Mix 1 scoop with 6 oz. of cold water or skim milk in a glass or shaker cup, or mix 2 scoops with 12 oz. of water. Use between major meals and before and after exercise. Read the entire label before use and follow directions provided. Premium Protein Blend (Whey Peptides, Whey Protein Isolate, Whey Protein Isolate 97%), Cocoa (Processed With Alkali), Soy or Sunflower Lecithin, Salt, Gum Blend (Cellulose Gum, Xanthan Gum, Carrageenan), Calcium Carbonate, Natural And Artificial Flavor, Silicon Dioxide, Acesulfame-Potassium, Sucralose. Premium Protein Blend (Whey Peptides, Whey Protein Isolate, Whey Protein Isolate 97%), Natural And Artificial Flavor, Soy or Sunflower Lecithin, Red Beet Powder (Color), Gum Blend (Cellulose Gum, Xanthan Gum, Carrageenan), Malic Acid, Silicon Dioxide, Acesulfame-Potassium, Sucralose. Premium Protein Blend (Whey Peptides, Whey Protein Isolate, Whey Protein Isolate 97%), Natural And Artificial Flavor, Soy or Sunflower Lecithin, Gum Blend (Cellulose Gum, Xanthan Gum, Carrageenan), Calcium Carbonate, Salt, Silicon Dioxide, Acesulfame-Potassium, Sucralose. For over 20 years, NITRO-TECH has been a leading protein brand. Built on a foundation of human research and cutting-edge science, it has earned the trust of countless consumers worldwide. Now the researchers at Team MuscleTech are proud to present a new formula based completely on rapid-absorbing whey peptides and high-purity whey isolates. Introducing NITRO-TECH WHEY + ISOLATE GOLD – a whey peptides and isolate formula that’s micro-filtered to remove more carbs, fat and lactose while retaining more BCAAs, aminos and glutamine! 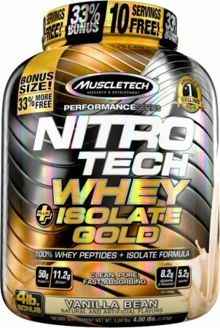 NITRO-TECH WHEY + ISOLATE GOLD uses only ultra-pure, micro-filtered whey protein isolate and whey peptides, the purest forms of whey protein you can feed your body. With a filtration process that uses precision technology to remove lactose, ash and fat, this amazing formula delivers the major bioactive protein fractions. NITRO-TECH WHEY + ISOLATE GOLD is not just loaded with muscle building protein, it’s also loaded with taste! Team MuscleTech researchers partnered with some of the world’s leading food scientists to deliver truly mouthwatering flavors you’ll love to indulge in! We’re confident you’ll love these incredibly delicious new flavors! Cookies & Cream This is a Buy 1 Get 1 FREE offer! Strawberry This is a Buy 1 Get 1 FREE offer! Vanilla Bean This is a Buy 1 Get 1 FREE offer!